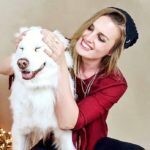 Best Omega 3 chews for dogs? Best Omega 3 supplements for dogs? 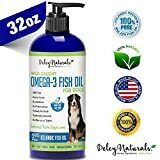 Best Omega 3 liquid supplement for dogs? 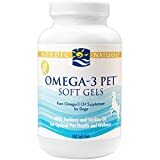 Best Omega 3 soft gels for dogs? How to get my dog to swallow Omega 3 pills? Sometimes you turn to look at your fur baby; realizing just how perfect they are, and how much we love them. When you love someone or something, that much – it is only natural to want what is best for them. An adequate diet is incredibly important, but a quality supplement may also be a good idea, to make sure they get all the nutrients their bodies need to function properly. Omega 3 is a fatty acid with stunning benefits for the body and mind of a dog, giving you the chance to do something for your four-legged friend that could potentially prolong his or her life significantly, thanks to the incredible health boost that comes with it. There are many different products to choose from, once you start looking, so what is the best Omega 3 product for dogs? 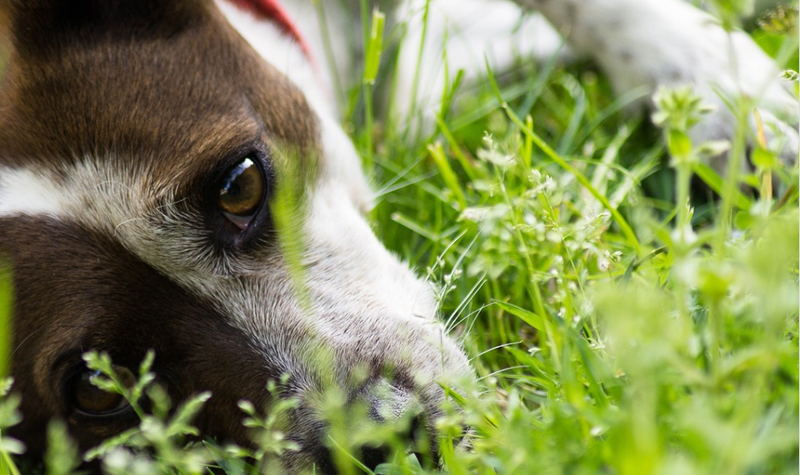 Are you hoping to find the best Omega 3 for dogs living under your roof? This Omega dog supplement uses the cleanest and purest fatty acids to create a powerful dietary aid to boost your pup’s immune system, and the liquid fish oil helps to soften the skin and fur while also working to reduce excessive shedding and skin irritation. Some dogs are fussy about taking pills or liquid supplements, but with soft chew treats like these – which taste just like regular reward treats – your pup will quickly be begging for more. 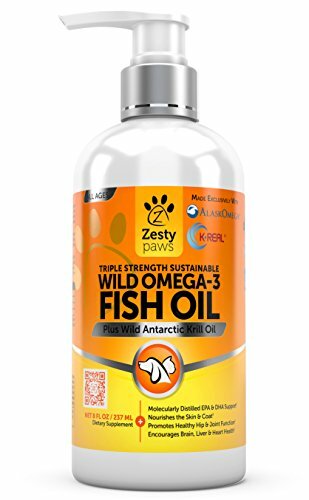 The Wild Alaskan Pollock in this supplement is MSC-certified free from harsh chemicals, to make sure your pet gets the healthiest and best source of Omega 3 for dogs available. Why We Like It – This is one of the best sources of Omega 3 for dogs that don’t like taking their medicine since the soft chews taste just like delicious bacon- or chicken treats. Easy to administer and packed with nutrition for your dog. 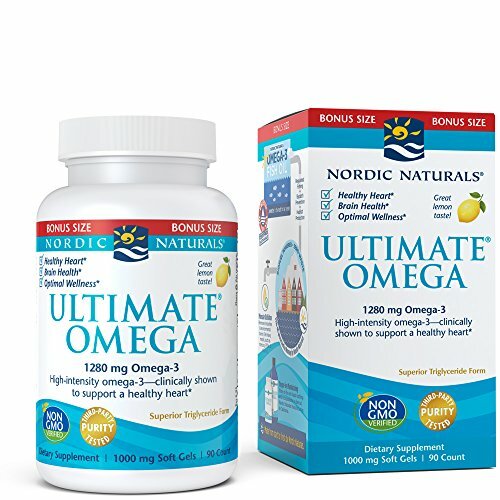 This premium supplement with Omega 3 for dogs is made with wild-caught fish from the icy waters of Iceland, which guarantees a high-quality product free from toxins, mercury, and PBC. It is human grade without fillers, binders or artificial ingredients, and each serving contains at least 800mg of EPA and 525mg of DHA. Considered a quality canine Omega 3 supplement; it can help reduce allergies, lessen shedding, promote healthy weight loss and help maintain both eyes, heart, brain and the immune system. Why We Like It – Being both environmentally friendly and safe for your dog, this liquid fish oil for dogs is one that cares. 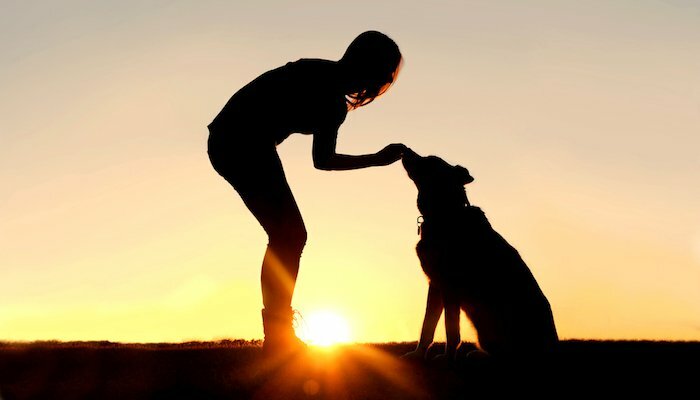 By giving it to your dog, you contribute to improving their health without causing damage to mother earth. Krill oil for dogs has numerous impressive health benefits; with Omega-3 fatty acids to support bone- and joint health, as well as mobility, being one example. It gives the immune system a boost, nourishes the skin and coat of the dog, promotes a healthy heart- and brain function and provides energy for a whole day of outings and fun! It is a supplement with Omega 3 dogs will love, thanks to the chewy consistency and delicious bacon flavor, and an easy way to complement their daily diet and make sure they have everything they need to stay happy and healthy for many years to come. Why We Like It – Is Krill oil good for dogs? It sure is! 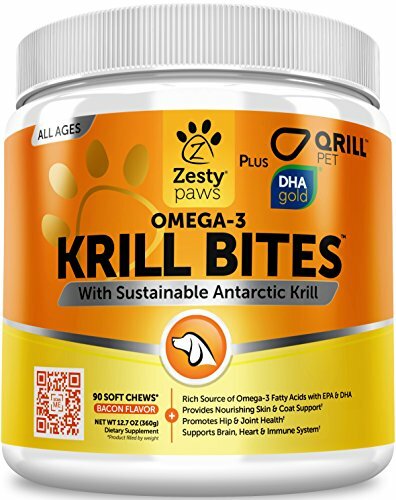 Here we have the best Krill oil for dogs that need a nutritious boost, and they are easy to chew and deliciously flavored – your pup won’t even know he (or she) is getting fed a supplement! These Omega 3 supplements for dogs come in small bottles, and you can either drip it onto their food (they will never know) or feed it to them on its own. It is a great health supplement for small dogs and cats; to help improve brain function, nourish the skin and coat, strengthen bones and keep the heart strong and healthy. It contains pure Omega 3 oil – derived from South Pacific sardines and wild anchovies – and it has been distilled to guarantee quality, purity and long-lasting freshness. Certificates of analysis from the European Pharmacopoeia and World Health Organization are available upon special request. This Omega 3 oil for dogs is high-quality, and the manufacturer knows that our pets deserve the best. 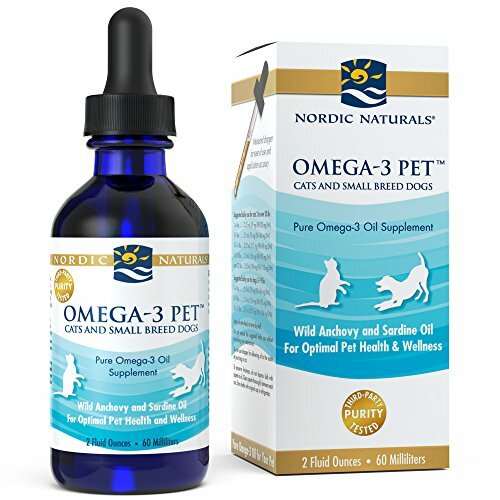 Why We Like It – If you are looking around for the best Omega 3 oil for dogs that tend to refuse to take their pills, chews or other supplements, then this liquid Omega-3 for dogs might be something for you! It is mixed in with the dog’s food – dry or wet – and is likely to go by unnoticed as your pup munches on their dinner. This is also a great natural anti-inflammatory for your pup. Get the best Salmon oil for dogs in your family and let them enjoy the health benefits of a delicious and chicken flavored soft chew. The immune system is key when it comes to general health, both in dogs and humans, and this omega oil for dogs works to nourish the body, boost the immune system and that way strengthen and protect it from illness, pain, and subjectivity to injury. It oils sensitive joints to keep them working as they should, fortifies bone, nourishes the brain to keep it continuously sharp while also protecting the heart. This supplement of Omega 3 for puppies and adult dogs is made in an FDA registered and GMP certified facility. Why We Like It – Omega supplements for dogs are great for making sure your pup gets all the nutrients he or she needs, in addition to their regular diet. 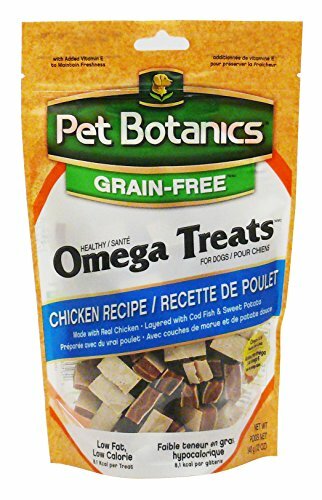 These chews with Omega three for dogs taste just like a chicken treat, and it is fascinating how much good can go into each small piece! The best fish oil for dogs with a lot of furs is one just like the oil found in these Nutri-Vet soft chews. The high-quality ingredients treat your dog’s fur coat from the inside; with vitamin D to help with itchiness and skin irritation, vitamin E for protection against oxidation (great to combat for example tearstains on white and lightly colored dogs) and fatty acids to add shine. You will quickly start noticing an improvement in your fur friend’s coat quality, but this mix of omega 3-6-9 for dogs will also work to improve their overall health and general energy levels. The product comes with clear instructions for how much to give a dog (or maximal results) depending on his or her weight. Why We Like It – This is the best Omega 3 supplement for dogs with a long and/or thick coat that needs extra care to get that Dog Show-ready! 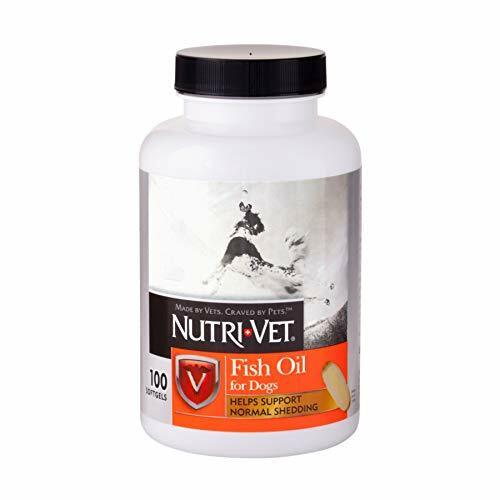 EPA and DHA are considered healthy fatty acids, and this Omega 3 supplement for dogs contain substantial levels of both – derived from cold-water fish. For a dog, Omega 3 can help support the nervous system, boost immunity, nourish the brain, heart and renal function and provide protection for sensitive bones and joints. While seniors might benefit a little extra form a supplement like this, in addition to a healthy diet, it is suitable for dogs of all ages (including puppies). The bottle has a practical flip-top lid that is easy to open and close, and the included measuring scoop makes it easy to give your pup just the right quantity. Why We Like It – The bottle is easy to open and close, and it is a quality supplement of Omega 3 6 9 for dogs that can be mixed straight into their daily kibble- or wet food meals. 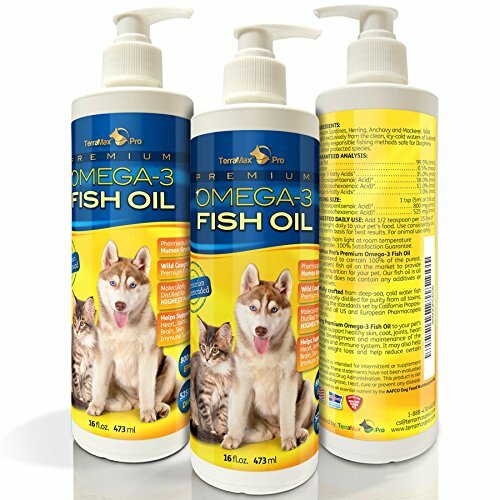 With a mix of wild Alaskan Pollock and wild Antarctic Krill – the best Omega oil for dogs is only a click away! 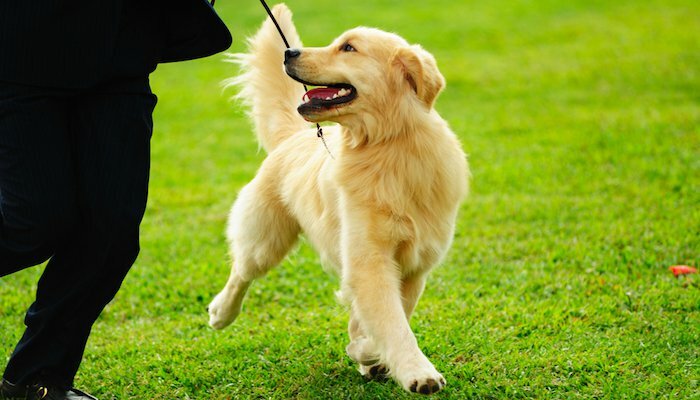 By providing a good quality source of Omega dog owners can help their pups reach their full physical potential; as it helps nourish everything from skin and coat to bones and joints, and all the way to the brain and cardiovascular function. It is a complete booster supplement packed with molecularly distilled DHA and EPA (refined for ultimate purity) and natural remedies for age-related illnesses and causes of pain. Keep your pup agile even as they grow older and see for yourself how the best Omega supplement for dogs can make their coat as beautiful as it once was when they were younger. Why We Like It – When trying to choose a supplement with Omega 3 for dogs reviews can be a great asset since it gives you a good idea of what the product can do for your dog. This product tops many lists of ‘Best Krill Oil for Pets’ out there, and it is not hard to figure out why once you try it. This sardine oil for dogs come from sardines and wild anchovies caught right off the coast of Peru – in the South Pacific Ocean. It is a high-quality oil for dog owners that want to provide their fur friends with the absolute best, and it can be used in both puppies, adult- and senior dogs. The soft gel pods can be squeezed out over the dog’s regular meals (mix it together if you have a picky eater), which then provides the recipient with nutrients to strengthen bones and joints – which makes it an excellent choice for aging dogs – while also keeping the heart, brain, eyes and coat in top condition. Knowing how to provide your pup with all the nutrition he or she needs can be tricky, but by providing them with the best fish oil supplement for dogs that you can find – you are giving them a head’s start in life and a chance at growing older without pain and discomfort. Why We Like It – Providing Omega 3 sources for dogs is beneficial since it provides them with a strong foundation to prevent certain health conditions. This product mixes easily with food, making it the best oil supplement for picky eaters that won’t accept pills or chew treats. Chances are your pup will come running every time you pull out the bag with this 5-layered and delicious Chicken-flavored treat! It is made with real chicken liver as the first ingredient, with no artificial flavors or preservatives. It is a grain-free product made with fresh quality cod, and it is full of vitamin A and D, as well as fatty acids (Omega 3 and Omega 6) and other premium natural ingredients and nutrients. You will quickly begin to see how your pet’s coat quality improves, and how there might be more shine in every hair than before. You might also experience reduced shedding since a healthy coat is prone to less hair loss. Why We Like It – This is the type of dog treat you can feel good about giving your pup! It is packed with protein, vitamins, minerals, fatty acids and more, and we bet your pet will love the meaty chicken flavor from real chicken liver. Once you set out to find the best Omega 3 and 6 supplements for dogs – you’ll quickly come to the realization that there are hundreds of products to choose from. There is herring oil for dogs, calamari oil for dogs, squid oil, fish oil derived from cod, salmon and more, and the mission to find the best oil for dogs can feel somewhat intimidating. What is the best fish oil for dogs? Don’t worry too much! Most fish oils have similar benefits, and it is more a question of finding a quality supplement that lives up to its promise, rather than choosing what fish type you want your oil derived from. When you do find the best Omega for dogs, you will possibly be amazed just by the small percentage of positive change that you can actually see! Omega 3 and other fatty acids are known for improving skin and coat quality, and many dog owners experience their dog’s coats becoming shinier and even to shed less than before! Who wouldn’t want that? Add heart health, a boosted immune system, better eye-sight, strengthened bones and joints and much more, and you will know why feeding the best Omegas for dogs in your family is one of the nicest things you can do for them. Now, what should you look for when picking a product? Something to look for in all edibles for dogs is natural ingredients! You don’t want to be feeding your fur pup a list of ingredients that you don’t understand what they are, or chemicals and artificial ingredients. When it comes to finding the best fish oil for dogs – the fewer ingredients a product has, the better it is. High-quality fish oil supplements will usually come with very few ingredients since the oil itself (in its pure form) is what provides all the health benefits. Look for products with few ingredients and real fish oil and try to go as natural as possible. 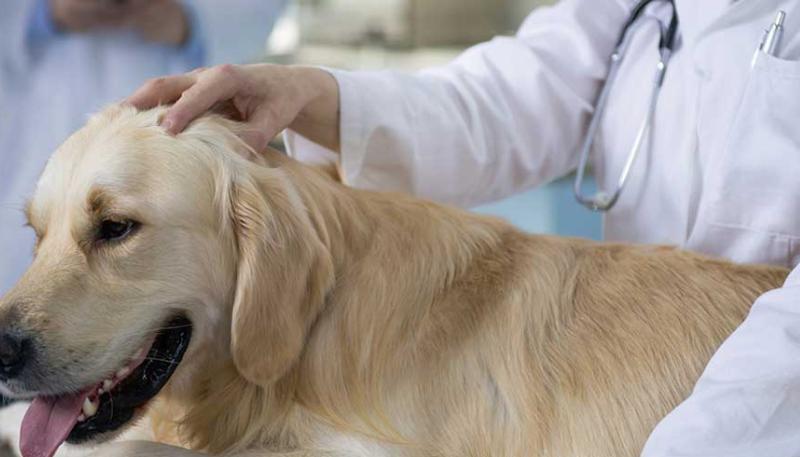 If you know that you usually struggle to give your dog pills and medication, then your best bet is to go with either fish oil in a chew treat, or liquid fish oil that can be mixed in with your pup’s food. All different presentations of quality fish oil and omega 3 are usually just as effective, so it depends on what you find the easiest to feed your dog. The chew treats are great for dogs that like to get a reward every now and then, but if your pup is suspicious of anything you try to give them – get the liquid kind (liquid or gel pods) so that you can sneak it into their dinner without them noticing. Not all products specify where their oil comes from, but it is always nice when you can see what type of fish oil a product contains, and where the fish came from. Wild caught fish means that the fish was not bought up in captivity, which usually means that the risk of it having suffered is significantly lower. Wild-caught fish also tends to have fewer toxins, mercury, and harmful chemicals, compared to fish that was not wild-caught. 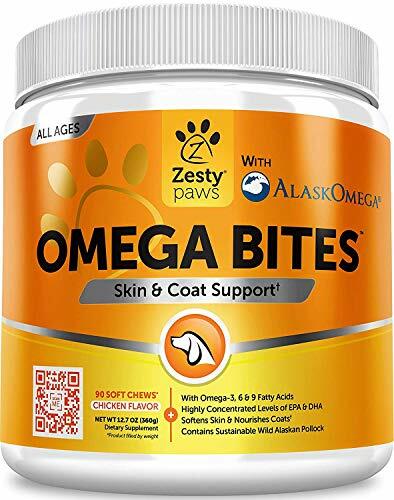 The first product on the list; the ‘Zesty Paws Omega Bites Skin & Coat Support Chicken Flavor Chews with Omega 3, 6 & 9 for Dogs’ are delicious chew treats that your dog will love. The oil is derived from high-quality wild-caught fish, and the health benefits are numerous. The best answer here is the following: Whatever works for your dog. All products mentioned here are good options for Omega 3 supplements, and it depends on whether you would prefer chew treats, liquid, gel pods etc. etc. Pick a product that you think your dog would agree to eat or one that you can hide and have him or her eat without realizing. Dog’s are so different that it is hard to point out a superior product, and it is up to every owner to make a decision based on their dog’s personality and individual needs. The ‘TerraMax Pro Premium Omega-3 Fish Oil Dog Supplement’ is veterinary recommended, certified Mercury free, made with premium fish and free from fillers, binders and artificial colors, flavors, and preservatives. A great option for anyone who prefers a liquid Omega 3 supplement for their dog. 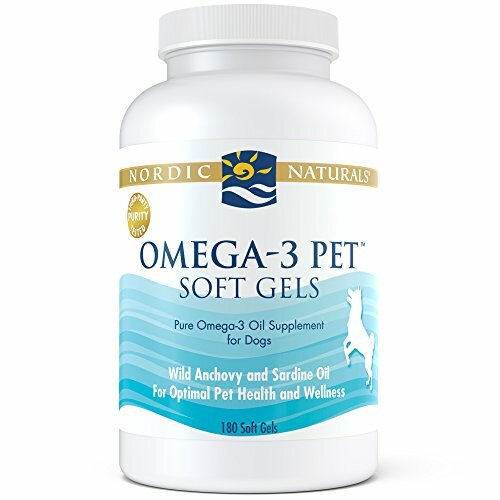 If soft gels are your preferred type of supplement, then the ‘Nordic Naturals Omega-3 Pet Soft Gels Dog Supplement’ is the way to go. It has been carefully tested by third-party labs to establish maximum quality, and it mixes easily with both dry- and wet dog food. Pills can be tricky to administer since not all dogs are okay with swallowing them. Options are liquid supplements or soft chews, but if you are standing there with an Omega 3 pill in your hand, then your best bet is to hide it in food (a slice of ham, peanut butter etc. etc.). Some dogs are smarter than that though and will spit out the pill just when you thought you’d managed to get it in them! You can always stick it directly down their throat, but that is likely to be an unpleasant experience for both of you, and you might want to consider switching to a different kind of supplement that does not come in pill form. Humans aren’t the only ones that need health supplements, but dogs can benefit greatly from it too. It is always better to prevent health issues when possible, and Omega 3 is known as one o the most powerful dietary supplements you can provide your pup with. Better coat quality, a stronger heart, a sharp mind, and improved mobility are just some of the things you can expect when starting your favorite pooch Omega 3 supplements. Set a daily alarm so that you remember to give your dog their supplements, or make sure to always administer it together with their breakfast and dinner. Fish oils (and Omega 3) has been proven to have the power to lower elevated levels of triglyceride, which significantly lowers the risk of heart disease in both humans and dogs.